Long post today, because I took lots of pictures on my day hikes at Bandelier National Monument and my visit to Los Alamos. I culled 186 shots down to 80, just for you, gentle viewer. My day began with breakfast in the back room at the Pantry, a favorite area restaurant operating since 1948. By the time I left there was a line at the door stretching outside, but that’s not because I’m a slow eater. I then drove north towards Los Alamos, a wonderfully scenic drive once one turns west off US 285 onto NM 502. It dives down to cross the Rio Grande and then wiggles westward until you turn off on NM 4 towards White Rock and Bandelier National Monument. There were signs of the nearby nuclear science lab, especially a large receiving dish off the road which is clearly in use since in the afternoon I would see it again, pointed directly upward to the sky. I passed eroded bluffs, clear inspirations for the Anasazi (ancestral pueblo peoples) to dig into the talus to expand their cliffside dwellings. The ashy rock was produced by the Jemez Volcano over a million years ago, which had two eruptions each estimated at 600 times as powerful as the recent Mt. St. Helens eruption, covering a 400-square-mile area in ash up to 1,000 feet thick. The 12-mile diameter Valles Caldera is a remnant of one eruption. Jeepers! I remember at the Mt. St. Helens Visitor Center a display showing how many eruptions dwarfed it, but the statistics are staggering. Soon I reached the entrance to Bandelier, which was named after a Swiss naturalist and that explains the difference in spelling from the term for a shoulder-strap ammunition belt. The monument has been closed for several weeks by the Los Conchas fire. The fire burned over 233 square miles of the Jemez Mountains and only a few of the over 70 miles of hiking trails have re-opened, with park staff busily sandbagging around the historic CCC structures in the park to prepare for flash floods and debris they know will come. Burned desert ground repels water, and the park reports that following the La Mesa Fire of 1977 Frijoles Creek flowed at thirty-two times its usual rate and destroyed about two dozen trail bridges, altered the stream bed, forced evacuations, and deposited three feet of silt behind the administrative buildings. So good luck to their efforts to prepare for what is to come when New Mexico’s afternoon monsoons of late July arrive. They waived the usual $12 entry fee and allowed me to go to the Juniper campground to hike two miles on the Tyuonyi Overlook Trail. The beginning looked unpromising, with a number of fallen and burned trees from old fires (this area was not burned in the Los Conchas fire). But in the distance rose beautiful mountains, perhaps helping inspire the Anasazi to build a circular shrine up here on the mesa. As the trail made a beeline along a ridge projecting on the edge of Frijoles Canyon, a distant highway looked like an absurd trail extension and improvement project. At the overlook there was a sign which told of how Tyuonyi Pueblo peaked in the late 1400s at about 400 rooms with up to three stories in parts of the circular structure. A brochure told me Tyuonyi translates as “meeting place” and is pronounced QU-weh-nee. The overlook provided a tremendous panoramic view of Frijoles Canyon, formed by El Rito de los Frijoles or “The Little River of Beans” – and I have no idea why the Spanish called the creek by that name. All around I could see closed trails begging to be hiked – darn that forest fire! I met a family from Maine by taking their group photo for them, and when they mentioned their disappointed desire to see more ruins, I told them that the Tsankawi area back north near White Rock was open and had some sort of ruins. They would follow that tip, for I ran across them there later and we had a happy conversation as we traversed portions of the trail there. But first I returned to my car and drove west, intending to hike the open Burnt Mesa Trail. But the parking area was closed for remediation and clearly the first few miles of the trail had been burned over, making the name most appropriate. So I drove onward to take NM 501 north into Los Alamos and zipped back east to the open Tsankawi Ruins, and that one has the more obvious pronunciation of SAN-kuh-wee. The ancestral pueblo people who settled in this area, the Pajarito Plateau, from roughly 1100 to 1500, were divided into different language groups which shifted in different directions when a drying climate and likely overpopulation and resource depletion led them to shift to pueblos along the Rio Grande. Those living in Frijoles Canyon spoke Keres and oral traditions say they moved to Cochiti Pueblo. But those living in the separate Tsankawi area spoke Tewa and moved to San Ildefonso. The trail ascended the pretty pink and white volcanic cliffs via a ladder. Up top I could see a creek heading eastward toward the gash of the Rio Grande and soon I encountered the ancient furrow in the tuff carved by millions of footfalls over the past millenium, which would guide me the rest of the way. The white trail led upward and then I found a spot making me wonder if they had their own version of Bigfoot, but of course they just wore out different paths over time. The view south was fantastic, and I stood aside from the channel for two hikers coming toward me. They laughed, saying they had done the trail backward because of a big group in front of them before they hit a fork. I certainly understood, and a few minutes latter spotted the big group trailing down the lower part of the loop like a trail of ants. I wondered why most of them had worn dark shirts for this hot sunny hike – my self-portrait along a particularly deep section of the trail furrow reveals my choice of attire: a white wicking shirt and a new Tilley hat, hurriedly purchased and rushed to me last week when I left my old misshapen one behind at a movie theater in Jenks. I reached a funny fork where those horizontally challenged among us might choose to deviate to avoid a narrow cleft of steps. I took the slim path up, despite my high-edge-of-normal BMI (perhaps I’m just dense) and was rewarded with a great panoramic view of a nearby mesa and a lovely view to the north as well. My, but the views from this mesa were memorable, with only the sweep of the highway to disrupt the north view, striped by huge cloud shadows. A squirrel dashed in front of me to stretch out under a bush, hoping to blend in. I waited until he got to work again, but as soon as I moved he flattened right out again. I reached the cliff edge and there met up with the folks from Maine whom I’d met earlier. Another ladder took us down to several runs of hand-carved caves in the tuff. I took shelter in one, grateful to get out of the sun for a bit. The talus trail was like an Anasazi hallway, with rooms on one side and a big canyon on the other. Some caves had petroglyphs and blackened ceilings – the Anasazi did this to make the ceiling less friable. I liked the niche in one cave. Some folks from Pennsylvania had me play peekaboo from behind a rock – a welcome breeze made me use my hat strap. I turned back at one point to capture a woman lost in contemplation. I came across a bluff face with petroglyphs, then another with many small pockmarks in it, presumably to provide Anasazi with a quick scramble to the top, but it would only appeal to a rock climber. The trail began to descend, offering a choice between a deep groove and a shallower set of steps. The Anasazi used axes to fell large Ponderosa pine trees whose straight, thick trunks made excellent vigas: the beams used to support the roof. Many viga holes of multiple levels are visible in Frijoles Canyon, but there was one spot at Tsunkawi with them as well, although the vigas here were small. The trail wrapped up along a ledge and I bid farewell to the folks from Maine, who were heading on to points westward, including Yosemite, which I simply must visit someday. From this long description it probably seems like the hikes took all day, but it was actually only lunchtime, so I drove into Los Alamos for what proved to be a mediocre lunch. But the restaurant was only a block from the Bradbury Museum, which my father and I had visited at a different site 20 years before. I decided to see how much it had changed, recalling that it is named after a longtime director of the lab, not science fiction author Ray Bradbury. The man who wrote There Will Come Soft Rains wouldn’t be a big fan of a nuclear weapons lab. The new rented digs downtown are much nicer than the lab building we visited in 1991, but the highlights were still the mockups of Little Boy and Fat Man, the bombs dropped on Hiroshima and Nagasaki. A kindergarten teacher and her husband took a new shot of me next to Fat Man since my students would only laugh at the one my father took of me by it when I was in my mid-twenties and still had some hair up top. Now they can laugh at the caption to the photo: Fat Man. Whether that means the bomb or their teacher is up to them! I took a shot of an instrument package used for underground nuclear weapons testing, something my students are unfamiliar with since our nation last conducted such a test in 1996. I took another shot for my class, of an Eniac circuit board, since we discuss that early vacuum tube computer when we deal with projectiles – Eniac was designed to compute artillery firing tables. After we work through deriving one simple range equation and contemplate the complicating factors we ignored, my students grasp why Eniac was so useful. Speaking of projectiles, the museum had a couple of missiles and mockups of their nuclear warheads on hand too. On my way out of town I halted when I spotted an imposing log building with extensions sticking out here and there. The intriguing center was Fuller Lodge, built in 1928 from 771 massive pine logs selected by architect John Gaw Meem. He was quite influential, and his Santa Fe-style home on Museum Hill is now home to the Museum of Spanish Colonial Art. When I toured that museum yesterday, I was frankly more interested in the house than its contents. Fuller Lodge was the dining hall for the Ranch School, a private school for boys which was purchased in World War II for use as a hotel and gathering place during the Manhattan Project. It was known as bathhouse row since they were the only rooms in town with bathtubs at the time. It is now a community center and home to a public art gallery. I wandered into the lodge and shot its main hall and a stairway, then captured one of its chimneys and other façade while outside. Driving back along NM 4, I stopped at a switchback to shoot a panorama and then drove into White Rock. Its residential streets were lined with houses which were an odd mix of faux-dobe and conventional appearance. The yards were similarly inconsistent, some with quite nice xeriscaping and careful use of cedars interspersed with yards afflicted with tiny, ugly, and unkempt lawns struggling in the desert. 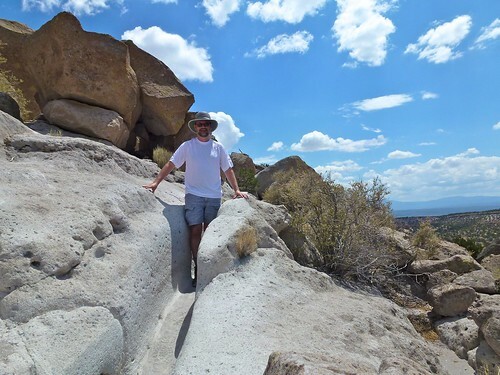 My purpose in visiting was not to pick the best yard, however, but to view from an overlook the immense White Rock Canyon, where the Rio Grande has carved 1,000 feet down into the volcanic rocks. Not a bad way to wrap up a long photogenic day. Upon my return to Santa Fe I showered and had tasty beef and chicken Tacos al Carbon with pork and beans at Los Patrillos. Tomorrow I journey north to Pagosa Springs, hoping to get in a hike along the way.